With the diversity of TV options ranging from network TV to cable and streaming, there are many ways to view shows like The Good Doctor, Breaking Bad, Speechless, and Marvel's Daredevil. Other shows like This Is Us has handled depression and anxiety, Shameless highlights bipolar disorder, and the Big Bang theory has characterized Sheldon as being intellectually exceptional without labeling him being as on the autism spectrum. I am very passionate about movies and TV shows that include people with disabilities because I appeared on Sesame Street and Romper Room in 1978. My cerebral palsy and my crutches had its drawbacks, but I also learned from an early age that my disability also made me more memorable to the people I encountered. It is also one of the reasons why I have often viewed my cerebral palsy as an oxymoron. As I grew up, I also found several TV shows and movies which helped me to motivate myself. I also felt less isolated because of some of the examples I saw on TV. The first show I fully identified with was The Incredible Hulk. They misunderstood green monster roared with anger because of the many uncomfortable and painful situations he found himself dealing with. But when he wasn't provoked or prodded by environmental circumstances, he acted innocently as he explored the world around him. Another reason why I identified with the show so much had to do with David Banner's heroic dilemma of helping others while he tried to keep a secret. The show often taught me to maintain my integrity while balancing my ability. In addition, Lou Ferrigno became a role model for me. I often channeled my frustration with the world into push-ups, and crutch presses with a goal of increasing my physical strength. I wanted to be like Lou Ferrigno until I realized in college that I could be my own hybrid hulk. Geri Jewell will be appearing this weekend at the Richmond ReelAbilities Film Festival on February 17 at the Weinstein Jewish Community Center. Admission is free. The Richmond ReelAbilities Film Festival also features films highlighting disabilities starting on February 15 and going until February 18. For more info and free tickets, go to: https://weinsteinjcc.org/cultural-arts/film/#reelabilities. Strength through disabilities can be flexed in many different ways. Parent Tip Tuesdays are authored by Rob Targos, self advocate in the special needs community with a focus on Cerebral Palsy. Opinions and ideas expressed are his own. To contribute to Project: Just Like You, please contact us! I left off last time talking about different ordeals. I talked about some of the physical emotional and social cards that I had been dealt. They were for blows to my psyche. I used what I learned from the police officers mentioned in the last installment I knew that freezing or stopping was the last resort option. Sure my body could stop moving or I can lose control and in a moment. But I decided, either consciously or unconsciously I'm not sure, to reshuffle my thoughts when I could not move or decide where to go. I'm not sure if it was in elementary school science class that I got the idea, but I remember a teacher once talking about the law of inertia. An object in motion, stays in motion, unless stopped an external force. When I was stopped outside of myself, I sometimes turned inward. When it was stopped physically, that doesn't mean that I lost that energy. That energy moved to become more creative. I began to pay closer attention to thoughts and words and how I can even move worked around like a grammatical gymnast. My mind already had an exposure to remembering notes as opposed to writing them. But the best example of sometimes operating on a deeper was when I gave a presentation on John Marshall. Not only did the teacher want us to do a historical report, but she also made it an oral presentation. After the first few times practicing the oral report from the kitchen table, I realized I started remembering things even before I got to that sentence or paragraph. The more I practiced, the more triggered the thoughts became. For example, Chief Justice John Marshall had a famous cousin named Thomas Jefferson. Marshall, and also got tangled up in the XYZ Affair. I even remember the only mistake I made which tangled my parents 'AYZ' license plate with the XYZ Affair. I not only got an extra 10 points on my grade but more importantly, I got the best applause I could remember as a kid. I even remember that it sounded better than the Liberty Bell that cracked during John Marshall's funeral. Maybe there is a higher purpose for that too. As a person with a disability, I know sometimes it can be difficult to think straight. Sometimes, it's easy to think logically. Other times it's better to think visually. Sometimes it's better to think creatively. It wasn't until I got to high school and got challenged about appreciating the opportunity for a mainstream education, that I replied to an administrator, "you should be thankful for my special education, to you." As René Descartes said, "I think, therefore I am." My general advice for a parent or educator is to expose and empower kids with disabilities, by teaching them to think and act for themselves. Support their thoughts and expressions as much as you would their arms and legs. Expose them to different experiences and options. But more importantly, support their decision-making process. People with disabilities are strong. Their feelings are important. They deserve to feel safe. And they deserve respect. Starting with those basic beliefs and helping to foster those values helps everyone ramp-up their higher education goals at their own pace. I was born in 1972. I attended preschool and kindergarten through United Cerebral Palsy in New York City. The first teacher I remember is a cop. 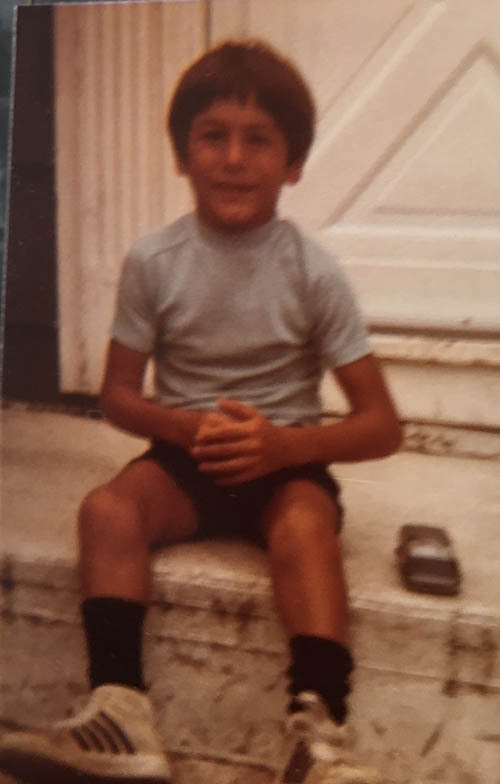 If you could see me: I was around five years old in Brooklyn. I held onto the steering wheel and I sat in the driver's seat. There were no traffic lights, no road signs but I went ahead because this was Greenpoint. I felt a tap on the shoulder. I held the wheel still or as still as I could with the spasticity in my hands. With cars parked on either side, I wanted to stay in the middle of the road. I rolled along at about 3 to 5 miles an hour. Then from behind the cop stopped the car. I slowly got out, slow was my regular pace anyway. The reached over and put my hands in cuffs. I learned many things from those early rides. When I got nervous, I held still, I didn't freeze. There is a difference. Handcuffs had a different meaning for me. Cops are cool. They solve some of life's mundane but weird problems. When faced with a choice I had to do the right thing. I attended Catholic elementary and high school. They didn't have IEP's in the 1980s. My parents met with the principal to discuss and negotiate my mainstreaming process. There are basic and reasonable accommodations made by the school. The basic rules pertained to safety. Liability became the school's first concern. They obviously didn't want me to get hurt, but they also didn't want to be sued. During first through third grade, classes were on the first floor. Teachers gave me a 5 to 7-minute headstart, before the end of class to leave and get ready for the next class. Recess and lunch were the only times I needed to negotiate stairs. Teachers also allowed me to finish tests during recess. Related to recess, I wore sneakers all day with my school uniform, in the once-a-week in gym class In fourth grade, my orthopedist recommended hamstring surgery. After surgery and recovery, I went back to school in a wheelchair and the cast. The school made arrangements with janitorial staff, teachers and some of the administrators to help me in school. I remember having trouble focusing because of the issues and scratches that a cast necessitated. But those were minor distractions compared to using the bathroom. Many times, even before the cast, I rushed out of class with ambulatory stiffness, legs braced and raced against the time given by my bodily functions. To my recollection, it averaged about once every two weeks.My parents arranged with the school nurse, to have extra changes of uniforms and underwear. My parents didn't want me to wear Depends or a diaper, because of the social stigma they associated with it. The cumulative impact of not having command of my muscles devastated me. But not having control of my bodily functions often obliterated my already shaky social confidence. To make matters worse, the gray pants I sometimes changed into had a noticeably different shade of grey. Then again, even grey/gray is spelled two different ways. The noticeable color change made me a soft target for misunderstandings and insults, especially with a groupthink mentality. Social survivability became secondary to academic achievability. After all, I could control my mind with much more efficiency than the repeated revolutions of my spastic stiffness. Physical therapy every day at night were coupled with weekly afterschool visits to Jawanio, a New York UCP affiliate. I had occupational therapy followed by physical therapy. Social anxiety also caused stuttering, but my parents didn't view it as an emotional problem. They saw it more as a personal problem. Remember times were different then. My parents wanted conditional compliance. They and others equated expressions of individuality or lack of conformity to weirdness that stemmed from my actual and perceived instability. Luckily, I had one special education ally. Mrs. Murphy, my seventh grade English teacher understood my struggles more than my parents and my classmates, because she had a son, Daniel, with down syndrome. She and I understood the confusing complications and personal pressures, like no one else. I did have friends that helped me and stood up for me and even tried to understand my disability. My friend, Tricia, struggled academically. Even though we struggled in different ways. We understood each other because we were often both misunderstood. Years later, after high school, she received an ADD diagnosis. She later worked at a high school in special education administration in New York. Over time, just like I was conditioning myself to compete and succeed, I realize now, my classmates and teachers were becoming conditioned to my disability. I understand when students tell me they are often confused, and overwhelmed by the accommodations or inclusion process. When students with disabilities and struggle with a basic level for safety and security, it can be more of an ordeal to focus on higher-level needs. Next week, I will continue to talk about struggles with education in grammar school and how Chief Justice John Marshall rang my Liberty Bell. Julia is Coming to Sesame Street! Let's Celebrate Autism Awareness Month!